If you really want to familiarise yourself with the rank of hands in Texas Hold'em, you should just get your hands dirty and play some poker. You'll pick it all up as you go along. However, the last place you want to be struggling to figure out whether or not you have the best hand is in the middle of a big pot. 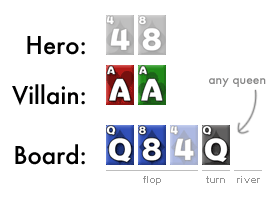 So instead, here's a quick Texas Hold'em hand rank quiz to battle your way through. If you can manage to answer all of these quiz questions correctly (or at least understand all the rules), you should have no problems with hand rankings in the middle of a Texas Hold'em game. Note: If you aren't already familiar with the following terms; we are the "Hero", and our opponent is the "Villain". What is your best 5-card hand on this board? Don't get thrown by the Ace in your hand and the two Aces on the board. Three-of-a-kind looks nice and is a fairly strong hand, but it's not as strong as the A-to-5 straight. Sure, you've "also" got two-pair, but it doesn't make a difference. The best hand on this board is the straight from T-to-A. Unfortunately, every other player in the hand has a straight too, so holding A J in this spot is no different to holding any two random cards. You're going to end up splitting the pot with all the other players left in the hand I'm afraid. 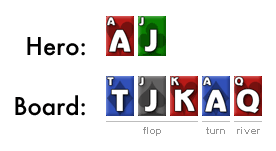 A flush beats a straight, remember? Apologies if this was a bit of an easy one, but I thought I should include a question like this for good measure. I didn't fully learn this basic rule for at least a month when playing in my home games. What starting hand would have the "nuts" on this turn? 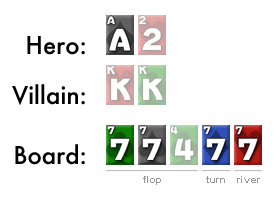 Note: The "nuts" is the best possible hand at the given stage in the hand. 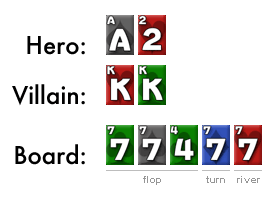 Any player holding 2 hearts with one of them being the K will have the nut flush. This beats any other flush, straight or 3-of-a-kind. 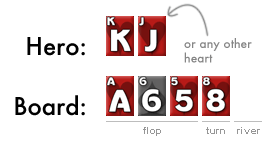 As long as we have got the K it doesn't matter about the value of the other heart, as it is not possible for any other player to have a better flush. If the board doesn't pair, is it possible for another player to make a better hand on the river? 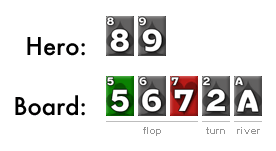 Yes, another player can make a better hand if the board doesn't pair. They can make a straight flush, beating our standard flush. For example, if the river comes the 2 and another player is holding 3 4 , they will improve to a straight flush and beat our standard flush. This is quite unlikely of course, but it's always good to know whether or not you're going to have the nuts for the remainder of a hand. Let's say we have bottom two-pair against an opponent's overpair. 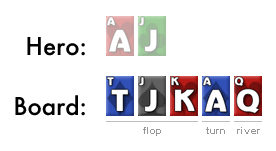 We currently have the best hand on this flop. Aside from an Ace, what card could come on the turn that would give our opponent a better hand than ours? If a Queen comes on the turn it will give our opponent a better two-pair -- a pair of As and a pair of Qs. Our best two-pair hand will be Qs and 8s with a 4 kicker. 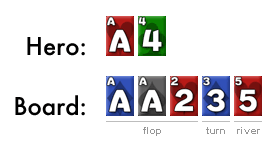 Sure, we've also got a pair of 4s lying around, but poker is a 5-card game, and there is no such thing as three-pair unfortunately. This annoying situation is referred to as being counterfeited. 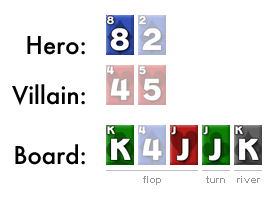 When the board pairs on the turn our pair of 4s effectively become useless thanks to the communal pair of Qs that we are forced to use. 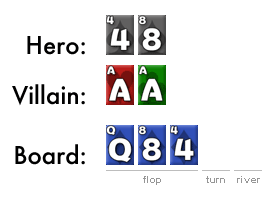 Be very wary of this situation the next time you have a low two-pair and the board pairs. It's a big reason why bottom two-pair hands cause so much trouble in Texas Hold'em - they're never quite as strong as you think. Who has the best full house? 8s are higher than 4s, so villain wins. Always remember to look at the biggest 3-of-a-kind first when evaluating the strength of full houses in poker. You only take in to account the pair part if both players have the same 3-of-a-kind part. This is another case of three-pair not counting for anything. You have to go with the top two-pair and the best kicker possible. In this example, Villain's pair of 4s is now useless thanks to the higher two-pair on the board. All he/she is left with is a 5-high kicker. Thanks to the K on the river counterfeiting our opponent's pair, we win the hand with our 8-high kicker. Seems a little unfair I know, but it's all about the best 5-card hand possible in Texas Hold'em. What is the worst possible hand on this board? Don't worry about suits on this one; just think about the two card values. 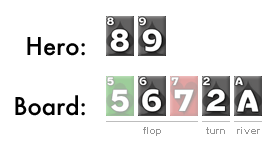 The key thing here is to find the two lowest cards that do not pair the board or make a straight. 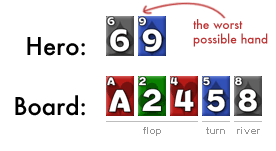 You can't get two cards lower than an 8 that will achieve this, so a 6 and a 9 will do the trick. 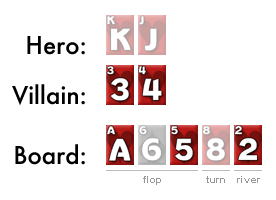 Absolutely any other possible starting hand (aside from the same hand but with different suits) will beat 96 on this board. Neither, it's a split pot. It wouldn't be a proper quiz without a trick question now would it? 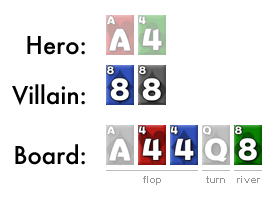 Both you an your opponent are using four cards from the board and the one Q in your hands to make the best 5 high-card hand you can. 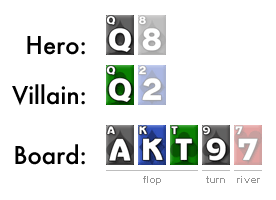 So the best hand each of you can make is A-K-Q-T-9. There are no prizes for nearly having a straight or nearly having a flush in this game. Having a better 6th card is useless too. Again, it's all about making the best 5-card hand. Unfortunately for our opponent, there are no prizes for having 4-of-a-kind plus a pair (or a "super full-house"). We win this pot with our 4-of-a-kind plus Ace kicker, whereas our opponent is left with 4-of-a-kind plus King kicker.